Lund boat owners are loyal to the brand. Whether you have had your Lund boat for 10 years, or you just bought a brand new one, most owners drive their boat around on the water proudly. Known as a wonderful fishing boat, Lund boats have been around since 1948. Still today, Lund boats are built with the same level of detail that they were when founder, Howard Lund, built his first boat more than 60 years ago. Just like any boat on the water, Lund boats are not invincible to damage. Chances are that there will be times during the life of your Lund boat when repairs are needed. It’s important for you to have a relationship intact with Lund boat repair specialists in the Minneapolis/St Paul, MN area. That is where our staff at Anchor Marine Repair comes in handy. Get your Lund fishing boat out of storage and ready for the fishing opener with our help! Whether you hit some debris on the water, or you damaged your Lund boat while trying to prep it for storage last fall, Anchor Marine Repair specializes in repairing your boat to better than its pre-accident condition. Earning recognition as the #1 boat repair shop in the Minneapolis/St Paul area did not come easy. Thanks to our dedication to customers and irreplaceable boat repair team, we are able to provide you with a boat repair experience that simply cannot be matched by our competitors. From structural repairs to upholstery repairs, our team has you covered and can get you back out on the water to fish quickly. We understand that getting your Lund boat over to a repair shop can be a hassle. When developing our customer service philosophy, we didn’t want our customers to use logistics as an excuse for not getting their boat repaired. To overcome this common excuse, our staff decided to offer complimentary pickup and drop off services within 250 miles of the Minneapolis/St Paul area. So what do you have to lose? 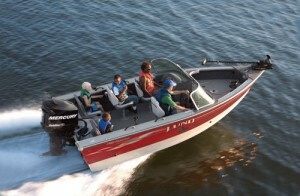 Don’t let the spring and summer fishing months go by without getting your Lund boat back out on the Minnesota waters! If you are ready to get your Lund boat repaired, team up with a boat repair shop that you can trust. Contact our highly reputable Lund boat repair team at Anchor Marine Repair today to setup a free estimate on your repair needs. Give us a call at (763) 972-3540 or email service@anchormarinerepair.com to learn more about our Lund boat repair shop.